A true alloy of wheat flour and a biodegradable polymer, BioCérès® products are biobased and compostable. 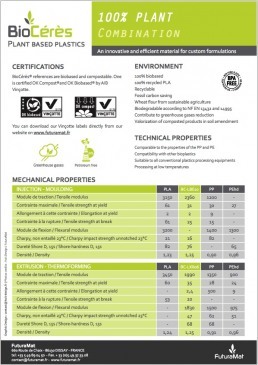 One reference carries the OK Compost® and the OK Biobased® labels. 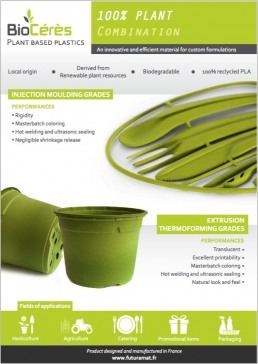 With the possibility of creating products from resources that are renewable, Bioceres® products are ideal for calendering, thermoforming and injection molding transformation techniques and are especially recommended for application in the fields of horticulture, packaging and, more generally, for disposable technical parts.